"The grass is never greener on the other side. It's greener where you water it." 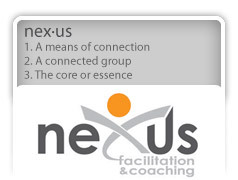 Facilitation allows the real conversations to happen with the support of an external facilitator. As a result, you can thrive as an individual, a team and an organization. As teams we are often tasked with multiple deliverables and minimal time leading to maximum stress. Team building can be in the form of a facilitated conversation for particular projects, getting to know each other better through personality, conflict styles or values-based assessments, or planning custom sessions and retreats aimed at meeting several objectives. Outcomes include better relationships, improved morale, and increased individual, team and organizational performance. Change is certainly a constant, but this cliché doesn't make transitions any easier. Organizational change often lays out objectives, goals, policies, procedures, systems and action items - and also often forgets about the impact on the people involved…those who are actually experiencing the change first-hand. Change & transition facilitation helps teams define, discuss and acknowledge the individual and team impacts of organizational change. We focus on the grief over what's left behind, and the future beyond the messiness of change. Outcomes include more empathy, compassion and support for one another along with hope and relief of what's waiting on the other side. Business families know first hand what challenges they're facing, but these concerns can be extremely difficult and awkward to talk about. Many use the dinner table to discuss the family business, often without much success. Family business facilitation is your chance to table the tough stuff that crosses the family / business boundary, have a productive discussion about what matters, and figure out what needs to be done, when, and by whom. Communicating effectively with the help of a facilitator leads to better decision-making, connected (and sometimes repaired) relationships, and more commitment to the outcomes. If your family business is really serious about effective communication, I'd highly recommend setting up a Family Council, which is a specialized form of governance specifically for family enterprise. Read Family Councils in a Nutshell [PDF] for a full overview. "I very much appreciate Niki's ability to keep her 'eye on the ball' even in situations where the path ahead is unclear; and through it all, maintain the trust and respect of those around her. I would highly recommend Niki to anyone - you can be assured that she will supply a degree of quality, creativity and commitment that is unsurpassed!" "I was immediately impressed with Niki and since working together she has been very insightful and helpful. She has a strong understanding of Family Business and is quick to analyze, explain and provide thought provoking questions to assist family businesses as they grow and evolve. Moreover, she does this in a very professional yet fun manner. I'd highly recommend Niki for anyone navigating the white waters of family business."